HomeThanks Barbie, for another reason NOT to want to be you! …I know this book was written in 2010, and I certainly never had a “Computer Engineer” Barbie book in the 80s, so this particular message didn’t directly impact me. However, I was quite shocked when I read these words and realized that I had spoken them almost verbatim recently. About a week ago, I told my husband (whose name happens to be the same as one of Barbie’s buddies) that I am learning to program because I want to explore how it can be relevant for me as a teacher, but design will probably always be where my strength will lie. In my imaginary world where we make some technological thing together, he’s the programmer and I’m the designer. Just to be clear, I don’t think there is anything wrong with design. My own statement was more about recognizing that design is something I’ve done, while programming is something that is brand new and will naturally take more time to learn. Design builds off many skills that I have nurtured over the years. Programming builds off skills that I pretty much gave up on when I was an adolescent. As such, I am finding myself in coding picking up right where I left off with math in my teenage years…gawkily bumbling my way through the necessary thinking that I swore off long ago. 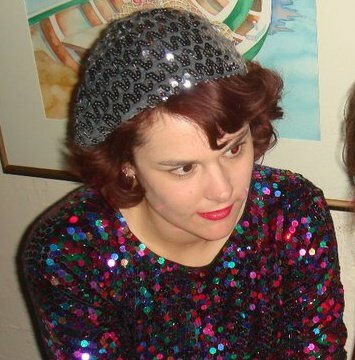 My attitude has little to do with being a woman, and everything to do with being a novice. I really sound like I’m trying to convince someone, don’t I? Really I think I’m probably trying to convince myself. As empowered a woman as I am, I recognize that it’s darn hard to change those really deeply embedded messages. Being “bad at math” (and potentially “bad at programming”) is one of mine, but I’m fighting it. 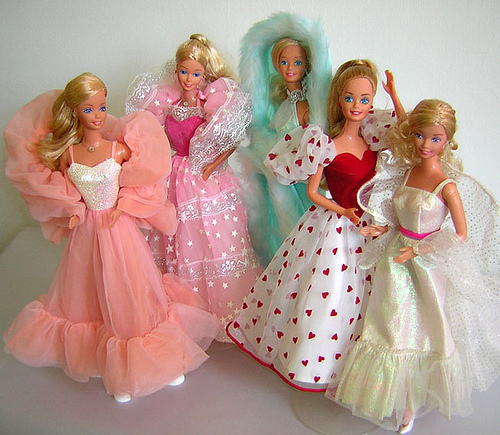 Barbie could very well have had an impact on me way back regarding what was normal and desirable for women to aspire to. I just happen to believe that it’s never too late to evolve one’s aspirations. I could ponder all of the gender stereotyped messages that I encountered in my life and how they impacted my current state of mind, but I think it’s more relevant to spend the time learning to code. I am happy for all the girls who will no longer be impacted by the Barbie portrayed in this book. However, I think we can all appreciate that she provided us with this chance to do some of the things that make us love and appreciate the internet most…reflect, learn, and rant…together. For all the little girls out there who are excited about programming, I am glad this book’s flaws were recognized and removed from print. Toy maker Mattel has worked hard in recent years to try to change the image of Barbie. The latest fiasco certainly is not helping with that mission. A day after the Internet erupted in outrage over the Barbie book — I Can Be a Computer Engineer — the toy maker has apologized for the title and the book is no longer being sold via Amazon’s U.S. site. The problem with the book is that it implies that girls are only good at design, and need to turn to the boys to do the actual coding. TechCrunch is absolutely right when they call this “cringe-worthy. I am also addicted to reading the many submissions on this site, which offers you a chance to re-write the pages of the offensive book. Some are definitely adult humor, but others are great resources to share with little girls who deserve a more empowered Barbie to read about. ← Universal Children’s Day: Do Children Have the Right to Learn How to Code? Well, there are three (at least) aspects to a computer system (lets call it a program). 1. Figuring out what it is for and what that means at the level of “action”. 2. Figuring out how to make it usable. 5. Writing the code to implement all these. Oh, I have 5 already. The design of the system consists of aspects 1 to 4, and usually pays more money. There is a clear misunderstanding that because Barbie is not writing the code she is doing only number 3 in the list. This is because most people haven’t got a clue about computer system development. Write a program to accept 3 numbers from the user and put them in ascending order. Then (part 2) do this for any number of numbers. You may make the input part finish by entering 999 (assumed not to be one of the numbers. I love it!! 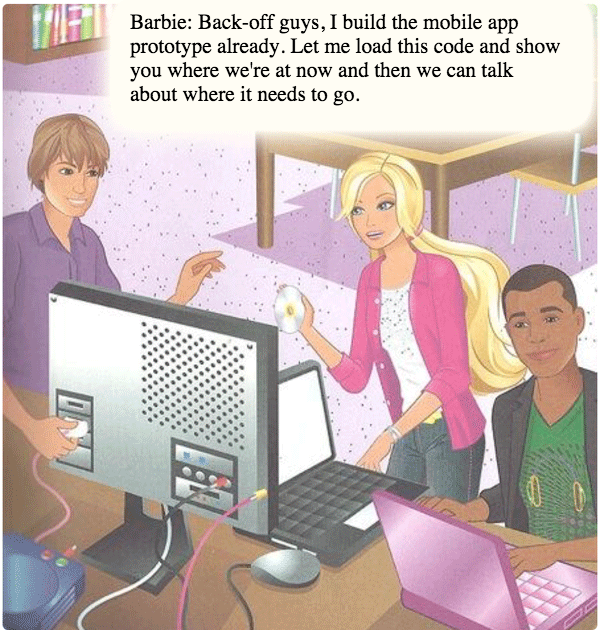 Barbie as misunderstood…she’s actually smarter for getting the boys to do the coding that she does not feel is worth her time! You should go to the “Feminist Hacker Barbie” website and write that version!! The problem with the original book is that Barbie doesn’t actually do anything except draw a picture of a dog, bumble around, break stuff, and call herself a programmer. Thus, she does #3, and then implies that she is incapable of 1, 2, 4, & 5. It is sad, because I’m sure that the woman who wrote the original book intended to inspire girls, but just didn’t understand enough about coding or design to execute the idea properly. Just one more call to de-mystify computer science!